Learn how to select and use detergents for critical cleaning applications. 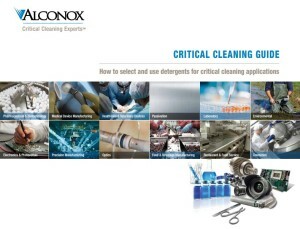 This guide gives you the benefit of our more than half-century of experience — including a method-by-method review of critical cleaning procedures, and a selection matrix to identify the right Alconox, Inc. detergent for your application. Click HERE. Get specific directions for using Alconox Inc. cleaners for different applications; using different methods and processes. Get specifics on cleaning via soak, manual, ultrasonic, CIP, washers and more. Click HERE. Not sure what detergent or method to use for your application? This document has the answers. Whether you’re in pharmaceuticals, biotech, medical device, healthcare, precision manufacturing or one of dozens of other industries, this guide highlights key concerns, soils, residues and the methods and cleaners that can solve your application’s critical cleaning challenges. Click HERE.